As brands focus efforts on keeping up with broadcasting trends across social platforms like Facebook, Twitter and Pinterest, many are neglecting a tried and true marketing tactic that could propel them even further: narrowcasting. Narrowcasting marks an emerging trend by which consumers are sharing content with smaller, more selective audiences. In contrast to broadcasting, narrowcasting is about tailoring information to better compel the recipients. It’s a competitive alternative, as evidenced by this infographic from Mogreet. While broadcasting gets a brand’s message out to a massive group of people, when it comes to who is actually reading and engaging with the content, the numbers are staggeringly low. For example, 84% of Facebook news feed stories aren’t viewed, 71% of tweets get ignored and 88% of emails go unopened. Meanwhile, 98% of text messages are opened, and therefore, companies that market through SMS/MMS have a far truer reach. Do these statistics surprise you? If you’re a broadcaster, does this graphic make you want to give narrowcasting a try? Share with us in the comments. Young people between the ages of 18 and 24 are even more connected to their mobile devices than you might think. Nine in 10 young adults spend between one and five hours on their mobile devices daily. Nearly one in 10, meanwhile, are on their gadgets between five and ten hours each day. Just under a third would actually like for brands to send them promotions via smartphone and tablet, but more than half say that it’s “extremely important” to be able to opt out of such come-ons. This is all according to a study by mobile interaction and payment agency mBlox, which commissioned a December study of more than 4,000 young mobile users in the United States and United Kingdom. According to mBlox’s chief marketing officer Michele Turner, the research provides important insight as advertising and marketing to people on the go continues to proliferate. “With 2012 largely being seen as the advent of mobile commerce, this research helps validate the huge revenue potentials for brands and an appetite by consumers for mobile marketing,” Turner said in a statement. In just one illustration of mobile’s importance to advertisers and marketers, Google reported that mobile devices accounted for 41% of searches for Super Bowl TV ads during the game earlier this month. But brands need to be careful about how they target those mobile users and how much knowledge they reveal about them. While 30% of survey respondents said they want offers to be located nearby, two-thirds said they don’t want brands knowing their whereabouts. More than half worry about their credit card information being stolen, and nearly half fret the risk of signing up for fake websites. The mobile payment industry has been making big moves lately, and it looks like consumers might finally be warming up to the idea of paying for things with their cell phones. The transition from carrying big, clunky wallets to a payment-enabled mobile device is beginning to revolutionize how consumers shop. 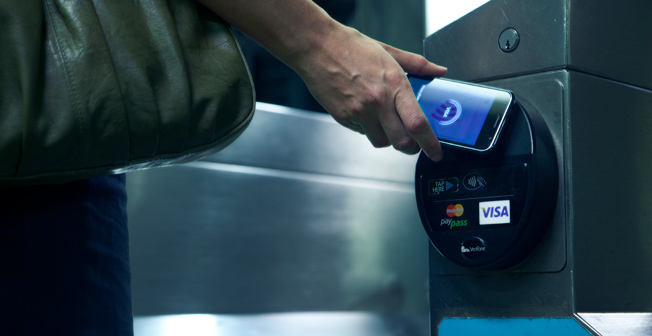 Of course, there is no set standard for mobile payments technology quite yet. Isis and Google are both working on their versions of the mobile wallet using Near Field Communications (NFC) technology, and PayPal is working on a cloud-based mobile payment initiative. Companies like Square and Intuit also help small businesses process payments via their mobile phones, and there are QR code-based payments in the marketplace, like LevelUp, where individuals are assigned their own unique QR code to pay with. In addition, companies like card.io and Jumio allow consumers to make payments by scanning the credit card with your smartphone’s camera. Mobile payments in 2011 topped $558 million in investment, up from $276 million in 2010, according to research firm Rutberg & Company. eMarketer projects that 37.5 million U.S. consumers ages 14 and up will make at least one purchase on their mobile phones in 2012.
eBay predicts it will do $8 billion in mobile gross merchandise volume and $7 billion in mobile total payment volume in 2012. PayPal exceeded expectations for 2011, reaching $4 billion in mobile payment volume, and with more than 17 million customers regularly making a purchase through their mobile phone. PayPal is also expanding its new mobile wallet trial services to more than 2,000 Home Depot stores across the U.S., allowing consumers to pay for items at checkout via mobile device or through PayPal and exposing thousands of people to mobile payment technology. The merge of mobile and money has made huge progress in the past year, which means retailers who embrace it will have a leg up on their competitors. 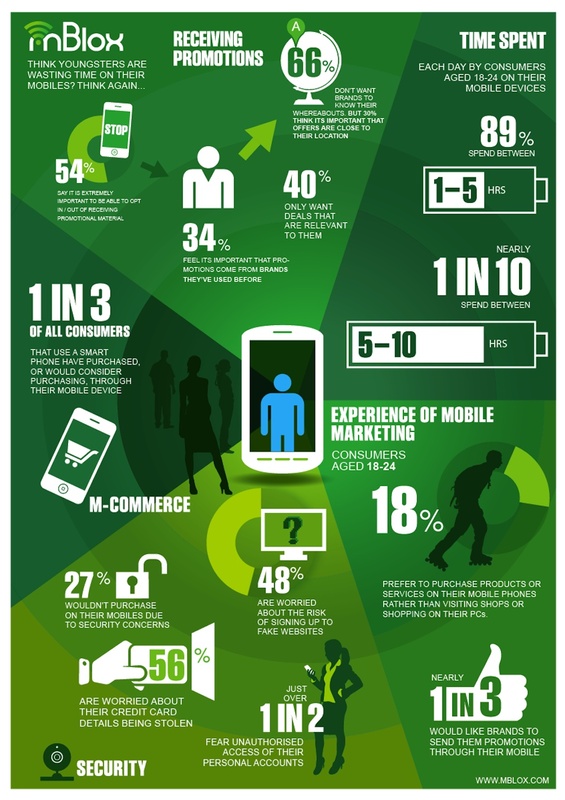 How will mobile commerce benefit the retailers bottom line? Mobile payments add value and convenience to the consumer. They will also facilitate the implementation of deals and offers through text messaging or apps, which will ultimately drive customer loyalty. The problem, however, is that consumers still trust their credit card companies and banks to drive mobile payments. However, KPMG’s fifth annual Consumers and Convergence survey has found that 23% of US consumers are now “very willing” to use their mobile phones as a wallet, and a study by Javelin Strategy & Research and PaymentOne found that 4 out of 5 consumers would spend more online if offered an easier and more secure way to pay. Without a doubt, mobile is a very personalized channel that businesses can use to directly interact with their customers, and mobile payments help enhance the in-store experience for consumers. As consumer attitudes about mobile payments start shifting, we will be seeing more and more people ditching their wallets. Starbucks is ramping up its mobile strategy and encouraging consumers to sign up for its My Starbucks Rewards program via an in-store call to action. 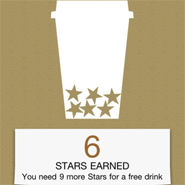 Via the My Starbucks Rewards program, consumers can earn rewards when they pay with their Starbucks Card. Free drinks and refills are one of the perks of the program. “Starbucks is wise to include SMS in its broad mobile portfolio,” said Jeff Hasen, chief marketing officer at HipCricket. Mr. Hasen is not affiliated with Starbucks, but agreed to comment as a third-party expert. Starbucks did not respond to press inquiries. The SMS call to action is featured in a small framed poster. The call to action is positioned near the drink counter so that when consumers wait for their drinks they can text-in to be part of the My Starbucks Rewards program. Consumers are then encouraged to register with any Starbucks Card and they’ll be on their way to getting free drinks and refills, no membership fee and free balance protection. Users can either register by going to http://www.starbucks.com/register or by texting the keyword GOLD to the short code 697289 (MYSBUX). 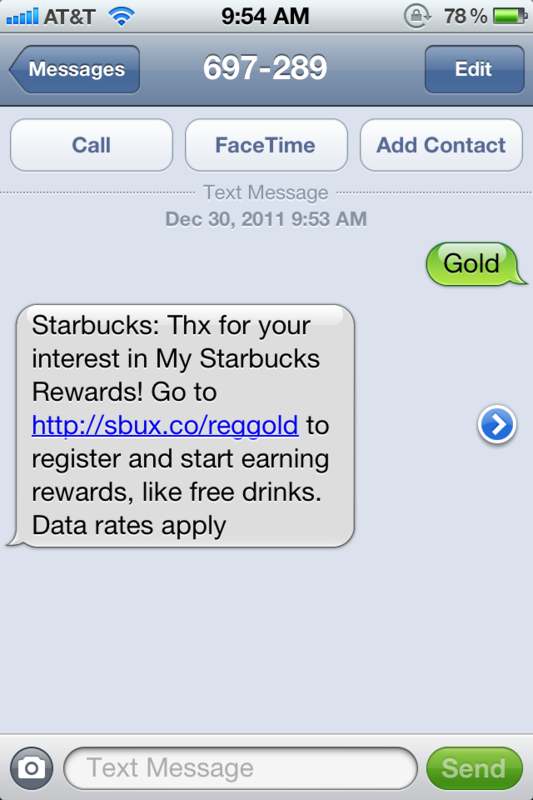 When consumers text-in, they receive a message from Starbucks that thanks them for their interest in the program and includes a link to the My Starbucks Rewards page. 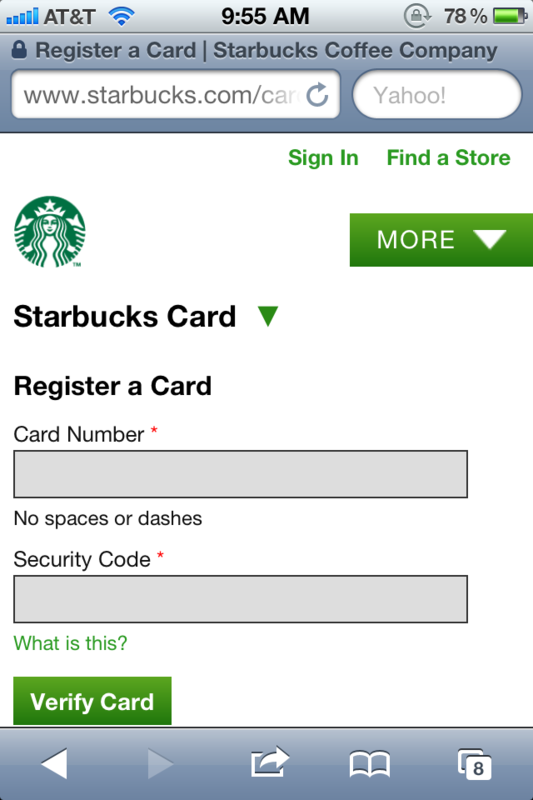 When consumers tap on the link, they are redirected to a mobile-optimized page where they can register their Starbucks card. Consumers can sign-in or create and account to complete the registration process. When users register their card they can protect their balance incase their card is stolen, earn rewards with each transaction, set up Auto-Reload for their card, view transaction history and transfer balances between their cards. Consumers can also download the My Rewards iPhone and Android application to keep up with their account. 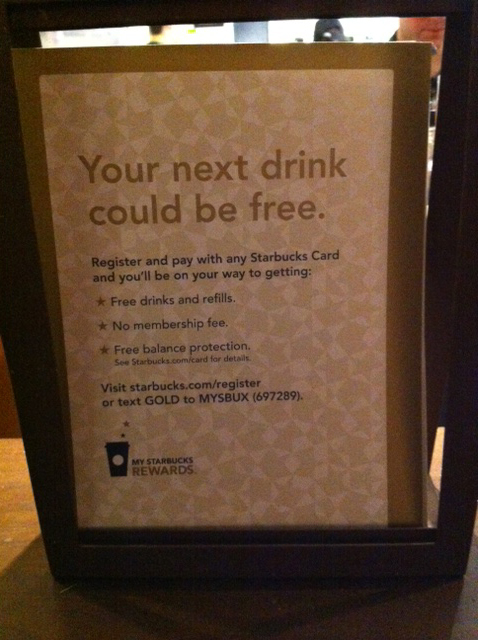 Using a mobile call to action such as this an effective way for Starbucks to builds its My Starbucks Rewards program. Additionally, place the SMS call to action in a location where many consumers are daily is smart. SMS is a great medium to engage consumers and helps marketers build their database. Consumers do not need a smartphone to participate and can use their feature phone to text-in. “Much like Macy’s is doing with Backstage Pass, Starbucks is giving customers choice on how to engage via mobile,” Mr. Hasen said. Take your stake in the mobile marketing game, because the industry is booming with success. With so many new innovations in mobile technology flooding the market—smart phones, mobile web, and social media platforms—it’s no wonder the trend is moving to the fore so quickly. Let’s think about the facts. Cell phones have become the nucleus of people’s lives in the past decade. Approximately 90% of the U.S. population owns one, and about 98% of those cell phones are SMS-enabled. What’s even more remarkable is that about 99% of all text messages are read by recipients—most within three minutes. You do the math. The newer generations are constantly on-the-go, engaged in their mobile devices, and more technology savvy than those in the past, which is why the marketing world has learned to adapt. Understanding those trends and leveraging the mobile opportunities is absolutely essential to marketing in the future. eMarketer, a group dedicated to research and trend analysis on digital marketing and media, projects that the global market for text message marketing will reach $12 billion in 2011. 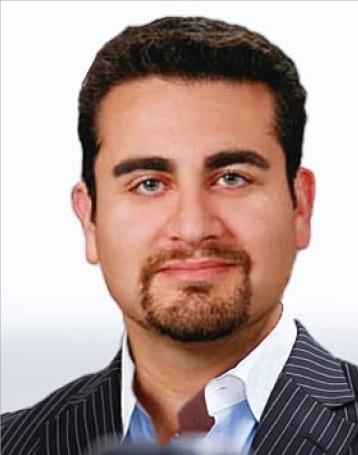 The reality is that mobile has an advantage over other advertising mediums. It’s relevant, instantaneous, personalized, and the reach is beyond compare. With experts expressing such high expectations for the industry, it’s a mystery as to why some businesses aren’t yet channeling the power of mobile. The industry has hit a global critical mass, and its lightning-fast evolution is nothing like the world has ever seen before. But as the network of mobilized consumers is expanding, so can your business. Cash in on the opportunities and move forward with the trend. Don’t just sit back and watch as mobile transforms into one of the most lucrative markets in the world. Jump in.